Andrew Grumbridge and Vincent Raison have published their unique portraits of life below the river in Today South London, Tomorrow South London. These born and bred South Londoners record offbeat days out and half-remembered urban adventures featuring pubs, cemeteries, galleries, hospitals and pubs again. London is one of the most written about cities in the world. Some of London, anyway. South London has been a slum, a resort and a neglected annex of the capital. But now in the 21st century, it has forged its own identity and purpose. 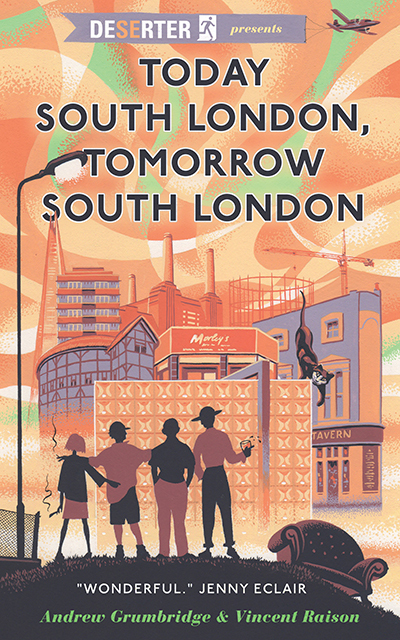 Today South London, Tomorrow South London aims to put South London on the map once and for all. So come along to celebrate this side of the Thames with Andrew and Vincent, and hear about the South London they discovered while writing Today South London, Tomorrow South London – described by comedian Jenny Eclair as ‘the ultimate reprobates’ handbook to God’s own side of the river’.